Sheldon and Miriam Adelson are contributing an additional $5 million to Birthright Israel, which the organization says will move 2,000 applicants from waitlisted to traveling this winter. The contribution announced Wednesday, a day after the Adelsons were honored in Washington by the group, doubles their contribution for this year to $10 million. The Adelsons’ foundation has given Birthright more than $100 million since 2007. 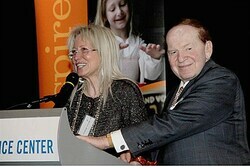 Adelson, a casino magnate, is a major giver to Jewish and conservative causes. Students who participate in programs in Israel return home impassioned and engaged; the challenge is for Jewish communities abroad to reach these excited, newly captivated students to maintain their level of interest in their Jewish roots and Israel. Like most Israelis, I spent Tuesday, October 18 glued to the television. I listened to the radio incessantly and checked my phone for news updates every few minutes. I wanted to keep as up to date about Gilad Shalit’s return to Israel as possible, and I wanted to share it with as many people as I could. But more than anything, I wanted to share my excitement about the news with my friends and loved ones abroad. Of course, I was not the only one excited about this historical event – my Facebook newsfeed was loaded with status updates and shared articles on the prisoner exchange. However, I was particularly pleased to see how many of my former students and campers from Jewish programs that I have worked with over the years were eager to share the news as well. Over the last number of years, I have been involved with different programs that give Jewish high school students the opportunity to come to Israel from anywhere from six weeks to four months. Once in Israel, these students undergo a transformative experience. As Jewish educators in Israel we have unique opportunities that our North American counterparts lack. For many participants, being abroad without parental supervision is an adventure, and a new culture and language give the experience added appeal. More importantly, we have students excited to be in Israel not for the beach, but to become more intimately acquainted with their Jewish roots…. I am proud of my students who have made aliyah, as well as those who volunteer in underprivileged communities and even become educators themselves. These individuals have been inspired by their time in Israel and wish to impart their values on another generation. Although knowing that I, along with other educators in Israel, have had a role in these achievements, it is up to the Jewish community in North America to give these teenagers and others like them the opportunity to stay involved with Israel even after their return home. Birthright participants at the organization’s ‘Mega Event’ in Jerusalem, February 2011. It is inspirational events like the return of Shalit that remind us of the lasting impression that positive experiences in Israel can have on Diaspora youth, and maintaining their impassioned relationship with Judaism and Israel for years to come. Arie Hasit is an educator at Ramah Programs in Israel and is beginning the Israeli bet midrash program at the Schechter institute. Republicans in the U.S. House of Representative introduced a bill reaffirming Bush administration principles on an Israeli-Palestinian settlement. The non-binding resolution, initiated May 23 by Rep. Robert Dold (R-Ill.) and so far sponsored by another 36 Republicans in the U.S. House of Representatives, reaffirms congressional resolutions in 2004 that backed up President Bush’s letter to Israel’s government that year that it was “unrealistic” that Israel return to 1967 lines. Those resolutions were approved overwhelmingly in both the House and the U.S. Senate. Dold’s initiative comes in the wake of disagreements between the Obama administration and Prime Minister Benjamin Netanyahu over President Obama’s policy of basing negotiations on the 1967 lines, with land swaps. Sen. Joseph Lieberman (I-Conn.) is contemplating a similar Senate resolution. According to The Hill, a daily covering Congress, Lieberman may garner the backing of some Democrats, as well as broad Republican backing. Taglit-Birthright in Argentina marked its 10-year anniversary recently with a series of events, including the opening of an art exhibition inspired by Taglit at the Carla-Ray Gallery in Buenos Aires, which received honors from the city. The event was attended by the Israeli ambassador to Argentina, Daniel Gazit, and the vice president of Taglit Marketing and Development, Prof. Ada Spitzer. To celebrate its tenth anniversary, Taglit-Birthright Israel initiated a unique project in Argentina, combining social responsibility and art. A group of students from the ORT Jewish High School in Buenos Aires created models of aircraft made of wood. Dozens of leading Argentine artists, Jews and non-Jews, painted on the planes, their inspiration being “the desire to identify”, as expressed on Taglit-Birthright Israel trips, which bring young Jews between the ages 18-26 to Israel, for a free ten-day educational trip. The aircraft represent the trip to Israel and the participants’ experience of discovering their identity that takes place during their stay in Israel. 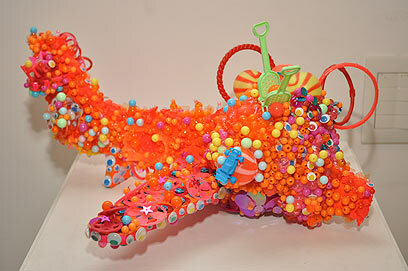 The exhibition has received the support of the Buenos Aires city government. The painted aircraft project was awarded the Cultural prize for social entrepreneurship last Thursday, by the Ecumenical Social Forum in Buenos Aires. The prestigious prize acknowledges initiatives aimed at improving community life and encouraging community solidarity.